Despite a slight fall in the number of fuel poor older households in England in 2012, the Government’s annual fuel poverty report projects that levels of fuel poverty are once again set to rise. In its new report Age UK explains how rising energy prices, leaky and energy inefficient homes and low incomes have resulted in the calamitous situation that nearly a million older people find themselves in today. Age UK’s ‘Reducing fuel poverty – a scourge for older people’ report calls on the Government to urgently tackle the nation’s problem of fuel poverty by driving forward a massive energy efficiency programme. It says that the only viable long term solution for fuel poverty is to make people’s homes as energy efficient as possible so that they can keep adequately warm at an affordable cost. More than 2.28 million households in England in 2012 were living in fuel poverty according to the Government’s new figures and cold homes made a major contribution to the 31,000 ‘excess winter deaths’ last winter. Not surprisingly, older people make up a large proportion of the fuel poor. Just under a million older people endure misery, hardship, anxiety, ill health and – in the worst cases – death, due to not being able to heat their homes adequately. New schemes to tackle the problem such as ECO and the Green Deal have been widely criticised and, above all, they are insufficiently ambitious to tackle the fuel poverty crisis we face. Targets to make all homes ‘fuel poverty proof’ – improving homes to a modern standard of energy efficiency, making them affordable to keep adequately warm. Whole-house improvements – not just offering the single most energy efficient measure but doing more if this is needed to make a house affordable to heat. Area-based, locally driven programmes – these are more cost effective to deliver than ‘scatter-gun approaches’. Serious involvement from the NHS, recognising fuel poverty as a driver of ill health. In the Charity’s new report, Age UK also emphasises the importance of health outcomes being at the heart of any new fuel poverty strategy and programme. The health implications of living in cold homes are well established, ranging from cardiovascular and respiratory disease to depression, at an estimated cost to the NHS of £1.36 billion a year. Caroline Abrahams, Charity Director for Age UK, said: “Unfortunately, today’s statistics show that fuel poverty is still a huge problem. As an older people’s charity we are particularly worried about the plight of nearly a million pensioners who can’t afford to heat their homes properly, but they aren’t alone – fuel poverty impacts on other households too, including families with children. “In the long term, the only sensible solution to fuel poverty is an ambitious energy efficiency programme to bring all our housing up to standard. Income subsidies play a crucial role at present in supporting older people to stay warm but we’d much rather live in a world in which they weren’t necessary: a successful energy efficiency programme could deliver this and help us to protect the environment too. There’s no denying it would be a major investment but it deserves a place in our national infrastructure plan: it would create jobs and growth and be a wonderful gift to future generations, as well as benefiting older people today. “No older person should worry that they could die from the cold in their own home. Fuel poverty has harmed our population, older people especially, for far too long. We want a permanent solution and we believe it is within our grasp, if there is the necessary imagination and political will.” Through its warm homes campaign – part of the charity’s annual Spread the Warmth Campaign – and in collaboration with the Energy Bill Revolution coalition, Age UK is calling on the government to invest in a bigger, more ambitious programme to improve the energy efficiency of homes across the UK. Such an infrastructure programme could lift nine out of 10 homes out of fuel poverty as well as greatly reducing people’s bills. The UK has among the worst insulated housing stock in Europe and a shameful record on fuel poverty – nearly a million older people can’t afford to heat their homes adequately and many millions more are struggling to pay their energy bills. 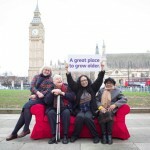 The Charity is also urging people to add their voice to Age UK’s warm homes campaign by visiting www.spreadthewarmth.org.uk/addyourvoice or call 0800 028 5535.